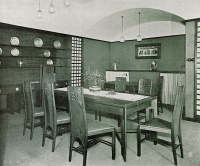 Mackintosh designed a dining room to be displayed at an exhibition organised by Alfred Grenander, the Swedish-born professor of architecture at the Museum of Applied Arts, Berlin. The exhibition was held in the premises of furniture-maker and retailer Arthur S. Ball in Potsdamerstrasse in central Berlin. Authorship: Photographs of the exhibited dining room were published in contemporary German journals under Mackintosh's name.